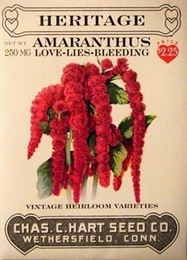 Originating in the Incan Empire, Amaranth has been grown as grain for over 4000 years. Was used by knights to symbolize purity and truth. Fast growing annual, 3-5 feet tall may need staking in exposed areas. Long weeping wine red trusses of flowers and seeds 18 inches long drape toward the ground. The tassels may be dried and used in autumn arrangements. Young leaves may be steamed or saut�ed like spinach and eaten. Sow seeds outdoors in late spring in full sun after danger of frost is past or start indoors 4 to 6 weeks earlier. Press seeds into soil, covering lightly. Prefers rich well drained soil. Thin or transplant 18 inches apart. Germinates in 10 to 15 days.